Gorgeous Luxury Home with Stunning Views! Minimum 3 Months Stay During Season! This beautiful vacation home offers the very best in luxurious, desert living. The spacious 2,900 square foot home is located in an upscale, highly desirable Indian Wells neighborhood. This is a luxury home, well maintained, well loved and owner have provided every amenity you could think of. When you walk in the front door, the first thing you will see is the gorgeous back patio and sparkling salt water pool, all surrounded by lush landscaping and beautiful patio furnishings. With the east facing patio, guests can enjoy their coffee in the morning sun while watching hummingbirds dart from flower to flower. It is a very quiet, restful setting. The pool is 4 1/2 foot at the deepest end. Inside there are two main living spaces. The more formal living room has a spectacular stone fireplace and the owners have added a large flat screen Wi-Fi TV streaming cable channels, NetFlix and much, much more. This is a great space for entertaining guests and the pub table can be used for cards or as a gaming table. This room also looks out to the pool area and with the high ceilings and surrounding windows, it is light, bright and inviting. Off the dining room and kitchen is a cozy den with flat screen cable TV and DVD player. The sofa reclines making it a comfortable spot for watching movies, reading or an afternoon nap! The kitchen in spacious and very well appointed … your family chef will love it … with all the gadgets, cooking and serving supplies you need to prepare a holiday feast or casual meal. A laundry room with outdoor poolside access, as well as a guest bathroom with shower, are located just beyond the kitchen, handy for wet pool towels and showering off after a swim. The sunny dining room off the kitchen seats six and also overlooks the pool area. This vacation home has two spacious and luxurious master suites with private baths. Both suites are furnished with king beds, luxurious bedding, seating, lots of closet and dresser space and flat screen cable TVs. One suite has a king size adjustable bed, both sides working in tandem from one control. The second suite has a king size Sleep-Number bed with dual controls. Just off the east master suite is a full office with desk and storage. A perfect space to set up your laptop or write the next best-selling novel. Since this is such a wonderful room, and probably has the best view in the home (you can see the Eisenhower Mountain), the owners have added a comfortable easy chair, creating yet another great spot for reading and enjoying the view. This just might become your favorite room in the house! There are sliding glass doors everywhere and on our perfect desert days, guests will enjoy throwing open all the windows and doors and letting in the fresh air and sunshine. Other amenities include Wi-Fi, cable TV, free U.S. and Canada calling, gas BBQ and two car garage. The yard, pool and spa are professionally maintained. 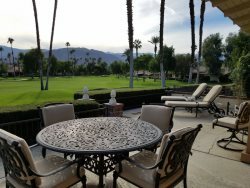 The city of Indian Wells is no longer issuing short term licenses, so rentals must be a minimum of one month … but once you’re here, you won’t want to leave! Note: This home has multiple levels. There is one step up leading to the bedrooms and a couple of steps down to the formal living room. For more information on this home as the updates are being done this summer, please contact Vacation Rentals of the Desert. Hurry … this home will not last long …it is absolutely spectacular!